Glamorous Jewelry for all occasion wedding prom night in Swarovski Rose Crystals Double stranded necklace with stud dangling surgical post earrings & matching double stranded stunning bracelet. Glamorous Jewelry for all occasion wedding prom night in Swarovski Rose Crystals Double stranded necklace with stud dangling surgical post earrings & matching double stranded stunning bracelet. Customize your wedding party & bridesmaid jewelry in any color they are hand-matched & hand strung the Necklace Earrings & bracelet is the ultimate layering piece or bold & beautiful on its own you must-have & make your dream comes true. This item in Traditional Necklace Sets category was first added to our catalog on 11-05-2015. Buy Match Your Jewelry Rose Attire Get Affordable Crystals Jewelry , sold & shipped by Fashion Jewelry For Everyone where you can shop online for Leading Online Retailer for Indian Fashion Jewelry. 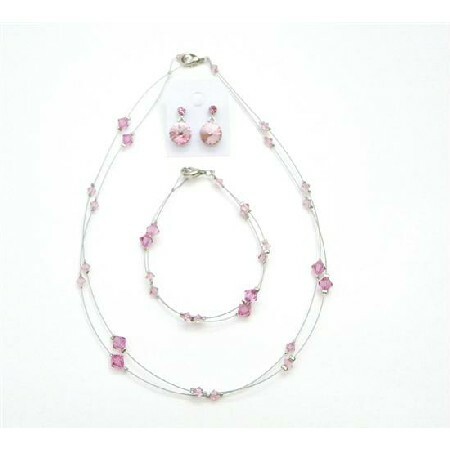 This Necklace Sets collection has been tagged as Match Your Jewelry,Rose Jewelry,Rose Crystals Jewelry,Crystals Jewelry,Affordable Jewelry,Affordable Rose Jewelry,Affordable Crystals Jewelry,Affordable Rose Crystals Jewelry,Rose,Rose Crystals,Crystals,Affordable,Jewelry.